This beautiful necklace comprises old, heirloom red coral beads and gold beads. There are also two small silver beads with applied granulation work. It is from the Minangkabau people of west Sumatra. 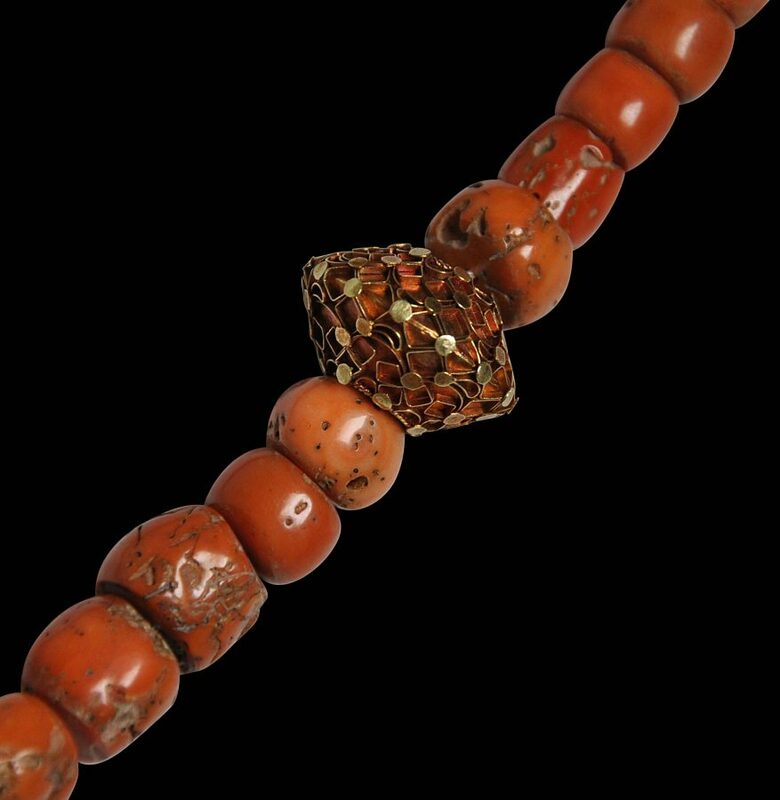 The coral beads sometimes are said to be imported from Tibet, and in Tibet, such coral usually came from the Mediterranean via old trade routes. It is possible that some coral would have passed along trade routes from Tibet to Sumatra, most probably via India. Certainly the coral is ancient and worn. The gold beads were made locally. They are of flattened, spherical form and decorated with applied flattened gold wire and granulation work – a motif known in the Malay world astelur ikan (fish egg) decoration. 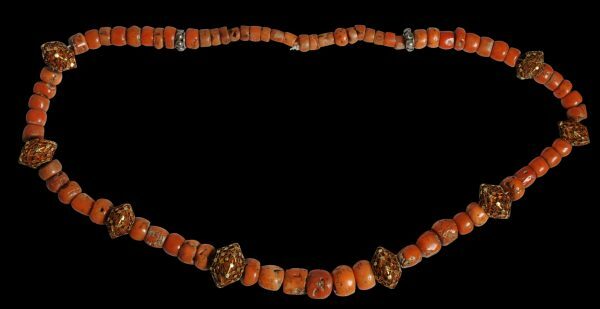 The decorative appeal of the gold beads has been further enhanced by red staining, which is typical of indigenous preferences in many parts of Southeast Asia. The red oxide over the surface would have been induced by rinsing the beads first in coconut oil. Next they would have been heated in a solution of sulphur and either kalamansi (citrus microcarpa) juice or tamarind pulp. Next, they would have been immersed in a solution of rock salt, alum, table salt and water, until the desired level of red hue was achieved. According to Richter (2000, p. 197), such necklaces were worn by married woman. The Minangkabau are matrilineal – family wealth is passed down the female line rather than the male line. It is for the reason that traditional Minangkabau families usually were desperate for daughters rather than sons. The beads have been re-strung on cotton twine. The strand is stable, very wearable, and especially attractive. Richter, A.,The Jewelry of Southeast Asia, Thames & Hudson, 2000. Summerfield, A., & J.,Walk in Splendor: Ceremonial Dress and the Minangkabau, UCLA Fowler Museum of Cultural History, 1999.